Setting the IDE color (including widgets and menus) in Windows. Again many thanks, this will really save my eyes and a lot of headaches. Shared the solution on the AGK forums, just in case someone wonders how to do this too. *And there's actually another(better) one for the widgets, menus and stuff then ClearlooksDarkOrange, called Adwaita, Zipfile posted by c0d3r9 here: https://forum.thegamecreators.com/attachment/81403"
You can even download new ones from www.gnome-look.org and other websites - should be for GTK 2.x then. PS: Maybe Qube could split our posts into a new thread - from your "quoting me" phost about the trial up to this - to avoid derailing that thread. Apparently they're using the default win gui colors(bright) and the GTK ones do not appear to be effecting this. Now MS in all it's wisdom has provided us with a 'nice' setting under: "Personalize>Colors>Default app mode:Dark"
Which in theory changes the white backgrounds to dark, but-but-but.. as you might have guessed, not so well implemented, for soon as I open Notepad or even an Explorer window, surprise-surprise: white background is back. Only works onto parts of the OS gui the actually bothered to take a look at I guess, such as the new Settings panel..
As the other things are System-based widgets. Maybe you could edit your Editor/share/geany.gtkrc.windows and append some stuff to manipulate widget appearance but I never tried, so dunno if this would be successful or not. 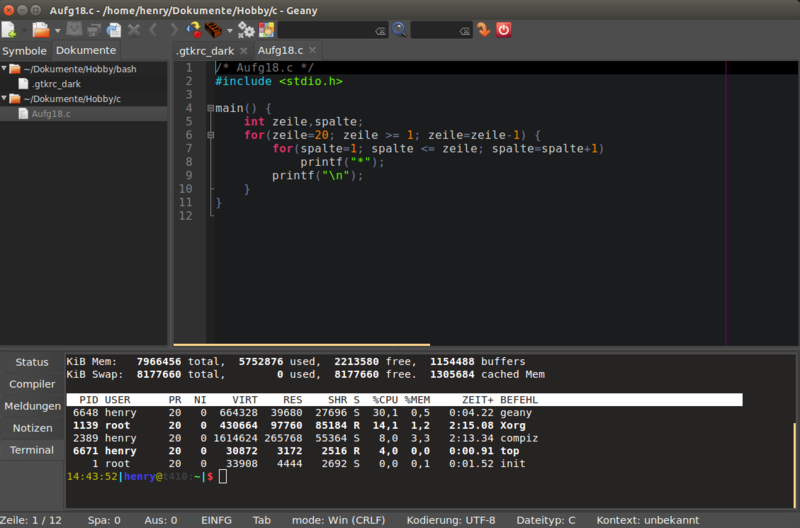 Yep, it says "Built on Geany 1.24.1"
Set the Color Scheme to "Geany Tango Dark" which I like best for my eyes. What I never get though is why in IDE's they let you change the color scheme *only* for the code itself, almost never for the menu bars, windows etc, so always leaving this too high contrast which pains my eyes. Luckily you can swiftly swap using "Toggle All Additional Widgets" but that still leaves the Project pane which I then manually move out of the way, but still stuck with a menu bar of course..
Is the IDE on Windows also based on Geany? (on Linux it starts a rebranded "based on Geany 1.24" variant of geany). As Geany is GPL some sources need to be provided too - at least they do for some stuff. Found the part for functions definitions (TagManager) but still looking for the Debugger-stuff. For my geany I made a BlitzMax-Module only being activated when focusing a .bmx file (it then adds compilation options + buttons to the menu) but it still misses the tooltips for functions (params), some kind of autocomplete and the debugger stuff. At least they (AGK creators) chooses a fast and nice scintilla-editor as base. .. Did not have it installed as ... ok, it costs money? ... wanted to write I haven't had the motivation to try it out but ... it costs money so it is nothing I would choose now (while I understand that people want to earn things for a living). Re: Setting the IDE color (including widgets and menus) in Windows. Why on earth people ever decided it was a good idea to have black characters on bright white lamp shining in your face is still a mystery to me. Plus is bad for battery life on OLED screens. Why on earth people ever decided it was a good idea to have black characters on bright white lamp shining in your face is still a mystery to me. Trying to mimic traditional black ink on white paper, but yes for staring at a screen for lengthy periods it tires the eyes. indeed, white letters of black paper(or such colors) are better for the eyes. And anywhere on the web i found a solution to invert pdf´s colors....some month ago....i can´t remember. Until they get electronic ink / paper to work properly for computers, I think they should stick to the dark tones by default and make light themes optional for those with eyes made out of solid steel. Yeah I wonder if anyone ever said "I totally prefer the bright theme, I want my eyes to hurt"
Speechless... ROFL please someone slap me! Hmm. Just installed the latest version of AGK, but was bit surprised to find that the editor that comes with it is a different version that doesn't allow for the previous approach on changing colors of the GUI. 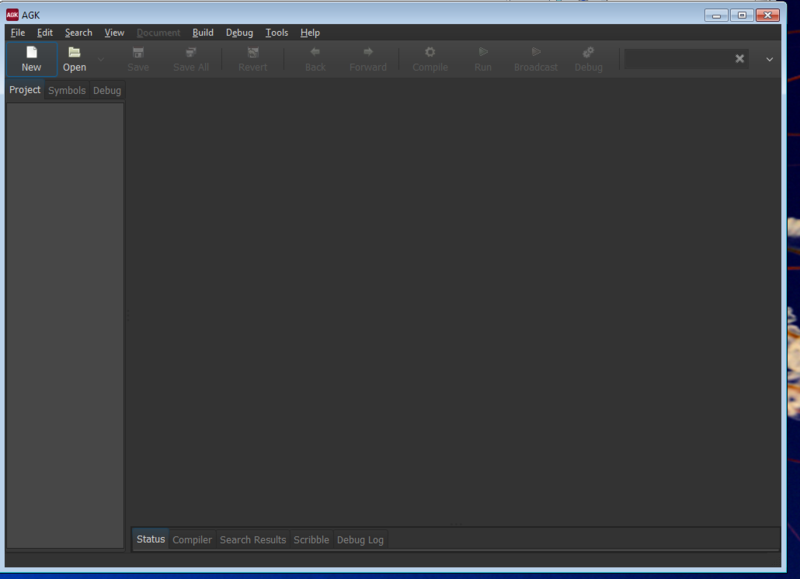 This is a bit of a pity for I'm not too eager using the Studio IDE when things are changing and still buggy. Not a happy customer here. That seems really weird. I wonder why they would bother taking the time to remove that stuff when they're developing studio. Have you posted this over on the TGC forums?